Will Emmanuel Macron help Theresa May save her Brexit deal? WPA Pool / Pool / GettyBritish Prime Minister Theresa May and French President Emmanuel Macron attend an official dinner at the Victoria and Albert Museum on January 18, 2018 in London, England. 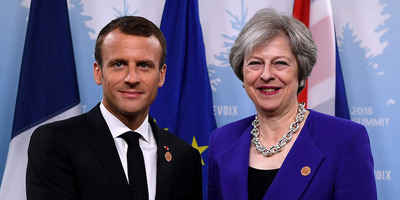 Macron is on his first official visit to the UK to attend the 35th UK-French Summit, which took place at the Royal Military Academy Sandhurst. Theresa May will meet with Emmanuel Macron on Friday to discuss Brexit. The private meeting will take place at Fort de Brégançon, the French President’s coastal retreat. The UK government believes charming Macron could hold the key to unlocking Brexit talks. However, Macron is a passionate Europhile, and has supported the EU’s firm negotiating position every step of the way. 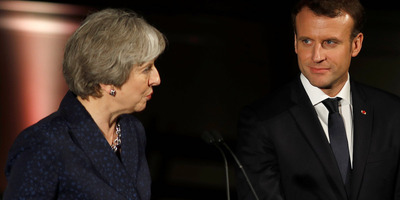 LONDON – Theresa May will on Friday visit Fort de Brégançon, French President Emmanuel Macron’s summer home in the south of France in an attempt to secure a significant breakthrough in Brexit talks. As business leaders warn that Britain is heading for a no-deal Brexit, May is attempting to go over the heads of EU negotiators and convince European leaders to help her broker a deal. Macron is one of the European Union’s two most powerful member state leaders, along with German Chancellor Angela Merkel, and could in theory go a long way to helping May. So will Macron budge and what hopes does she have of a major breakthrough today? Last month, May revealed to ministers her vision for Britain’s future relationship with the EU after Brexit. Under the plan, Britain would effectively remain in parts of the single market, making future trade deals with countries like the US more difficult, and stay closely wedded to the EU on customs. However, hard Brexiteers in the Cabinet claimed the prime minister’s plan would keep the country too close to the EU. David Davis and Boris Johnson quit their Cabinet roles as Brexit secretary and foreign secretary in protest against it. Staunch Remainers also criticised the plan saying it wouldn’t keep us close enough to the EU. For example, May does not want to keep Britain in the single market for services, despite services accounting for around 80% of the UK economy. The EU wasn’t keen either. Michel Barnier, the EU’s chief Brexit negotiator, has publicly rejected key pillars of May’s plan:the UK collecting EU customs on the bloc’s behalf, and staying in the single market for goods. This, plus a series of Tory Brexit rebellions in the House of Commons which came perilously close to bringing down May’s government, means her Chequers plan looks in serious trouble. Can Macron be May’s saviour? This is where Macron comes in. The UK government is spending the summer trying to charm leaders of EU member states, in the belief that a change in mood on Brexit among EU leaders could trigger a change in mood in the European Commission. The European Commission is the EU institution which sets out negotiating guidelines for Barnier to follow. Macron, along with German leader Merkel, is probably the most powerful and influential national leader in the EU. If France and Germany were to call for a change in the EU’s Brexit stance then the commission would sit up and listen. The UK government recognises this and has spared no efforts in trying to get the French government on board with May’s Brexit plan. Brexit Secretary Dominic Raab, Foreign Secretary Jeremy Hunt, and Business Secretary Greg Clark have all had meetings with their French counterparts over the last few days. 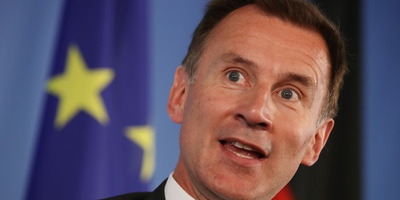 Hunt urged France and Germany to lead the EU to a “sensible” Brexit, in a clear sign that the UK believes the key to making the EU more flexible is through persuading its two most powerful members. “France and Germany have to send a strong signal to the Commission that we need to negotiate a pragmatic and sensible outcome that protects jobs on both sides of the Channel because for every job lost in the UK, there will be jobs lost in Europe as well if Brexit goes wrong,” Hunt said. There are two big issues with the UK government’s plan to woo the French. Firstly, one of the main reasons the EU has been so reluctant to budge in Brexit talks is because of the tough lines taken by Germany and France. France under Macron, more than any other EU member state, wants to preserve the integrity of the EU, particularly the indivisibility of the single market and its four freedoms. As former UK ambassador to France, Lord Ricketts, told the BBC this week: “He [Macron] is the last person to want to break ranks with what has been quite an impressively disciplined EU side. One of the main strategies of the UK government has been to seek to exploit differences between the European Commission and powerful EU member states. However, while there have been disagreements on smaller issues, the EU27 has generally been united up to this point, with Macron leading the pack. 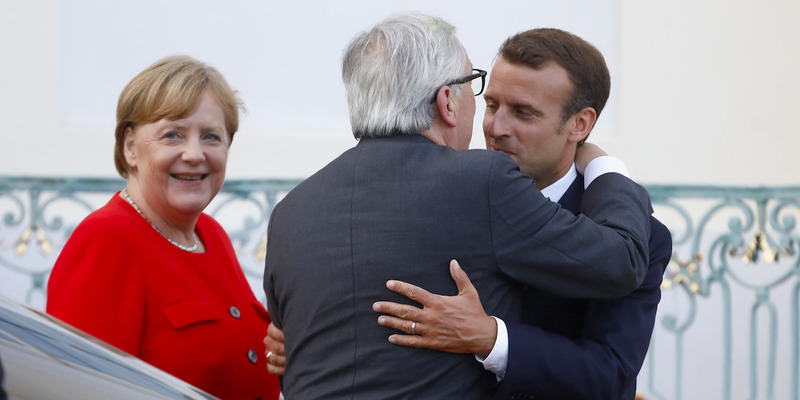 Michele Tantussi / GettyGerman Chancellor Angela Merkel and French President Emmanuel Macron greet EU commission president Jean-Claude Juncker at Schloss Meseberg governmental palace during German-French government consultations on June 19, 2018 near Gransee, Germany. And here’s the second problem. Macron is perhaps the most pro-Europe leader France has ever had. He has called for EU member states to become more integrated, not less, with some his ideas for a closer EU including EU-wide tax harmonisation, “European universities” and an EU military and defence budget. Brussels was delighted when Macron was elected the president of France. Faced with challenges like the migrant crisis, the rise of populism, and the Brexit vote, Macron was heralded as the potential saviour of the EU. So in trying to get Macron on board with Chequers, Prime Minister May has an almighty task on her hands.